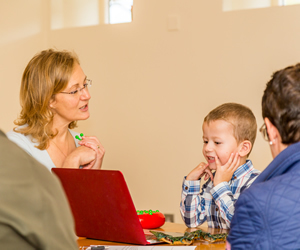 I am Elizabeth McBarnet, an Independent Speech and Language Therapist with 29 years’ experience working with a wide range of speech, language and communication difficulties. I gained a 2.1 Honours degree in Speech and Language Pathology from Manchester University (1990). Since then I have worked in a community clinic with a large, paediatric caseload; a neuro-rehabilitation hospital for adults with acquired brain damage and acute hospital settings with adults with neurological damage. For the last 15 years I have run a successful private speech and language therapy practice while raising my three daughters, working extensively with both adults and children. I continue to enhance my knowledge through the required Continuing Professional Development as specified by HCPC. Using formal and informal techniques, I am trained to diagnose, manage and treat communication difficulties using a combination of teaching, empowering and playing. I strongly believe that a child's parents are their best teachers. So I encourage parents and other primary carers to be actively involved in the therapy process- nurturing parents so you can nurture your families.